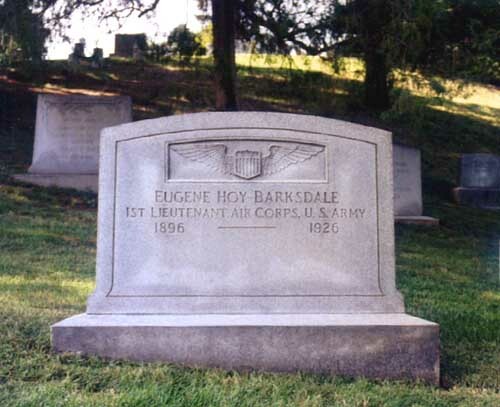 Barksdale Air Force Base was named after Lieutenant Eugene Hoy Barksdale, a U.S. Army Air Corps pilot who lost his life August 11, 1926, while flight testing an observation type airplane near McCook Field at Dayton, Ohio. Barksdale was born November 5, 1897, in Goshen Springs, Mississippi. Known throughout his life as Hoy, he was one of seven children - two boys and five girls. His family members were farmers with a rich military tradition dating to the Revolutionary War. Barksdale attended Mississippi State College but left during his junior year to enter officers training camp at Fort Logan H. Roots in Little Rock, Arkansas. He volunteered for the aviation section of the U.S. Army Signal Corps as a Private First Class. He later went to England to receive his flight training with the Royal Flying Corps and was assigned to the 41st Squadron, Royal Flying Corps, in 1918. A year later, Barksdale was assigned to Mitchel Field, Long Island, where he married Lura Lee Dunn in 1921. He set several flight records at Mitchel Field. A veteran of several successful parachute escapes from aircraft, Barksdale was testing a Douglas O-2 observation airplane for spin characteristics, and found it necessary to parachute from the craft when he could not recover from a flat spin. His parachute became entangled in the wing's brace wires, causing Barksdale to fall to his death. He was buried with full military honors in Arlington National Cemetery. Barksdale AFB is located within the Bossier City/Shreveport city limits. The base was activated in 1933 and named in honor of Lieutenant Eugene Hoy Barksdale, a WW I airman killed in August 1926 near Wright Field, Ohio. March 7, 1924: Lieutenant E. H. Barksdale and B. Jones (USAS) flew DH-4B Liberty 400 on instruments from McCook Field, Dayton, Ohio, to Mitchel Field, New York. After training with the Royal Flying Corps to fly in World War I, Barksdale kept in correspondence with his friend from basic training Lieutenant Ira C. Eaker. Eaker was so impressed with Barksdale's exploits that he signed on to become a pilot in the new air service. After the War, Barksdale and Eaker would cross paths several times. In fact, Eaker was in Barksdale's wedding party. The other air power leader that severed with Barksdale was a man who would do much during his career was "Jimmy" Doolittle. One of Barksdale's sisters would baby-sit Doolittle's boys when visiting him in Dayton Ohio. At the time of Barksdale's death in 1926, he was acting chief of the test pilot section in the absence of the chief "Jimmy" Doolittle. 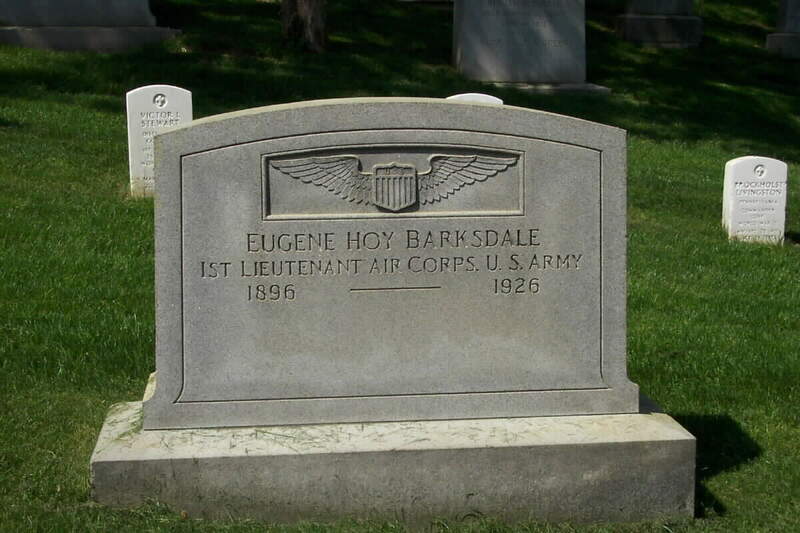 Barksdale AFB is named in honor of Lieutenant Eugene Hoy Barksdale, Air Corps,U.S. Army, who lost his life August 11, 1926, while flight testing an observation type airplane over McCook Field, in Dayton, Ohio. Lieutenant Barksdale was born in Goshen Springs, Mississippi, November 5, 1895.He attended Mississippi State College, but left during his junior year to enter the officer's training camp at Fort Logan H. Roots, Little Rock, Arkansas. He volunteered for aviation a few weeks before recieving his commissionas a Second Lieutenant and enlisted in the aviation section of the U. S. Army Signal Corps as a Private First Class. After completing the ground school course at the School of MilitaryAeronautics, (Austin) Texas, he embarked for England September 18, 1917, and received his flying training with the British Flying Corps at Oxford and several other aviation schools in England. He accepted his commission May 26, 1918, at Markse, (Yorkshire) England. thedestruction of three enemy aircraft through aerial combat. He also participated in the ground destruction of five other enemy aircraft. He left the RAF October 15, 1918 and was placed in the 25th Aero Squadron until December 24, 1918. After the war he became a test pilot and lost his life while flight testing a Douglas observation airplane. Lieutenant Barksdale attempteda bail-out from a fast spin only to get his parachute caught in and severed by the brace wires attached to the stabilizers at the rear of the plane. The Lieutenant fell to his instant death. 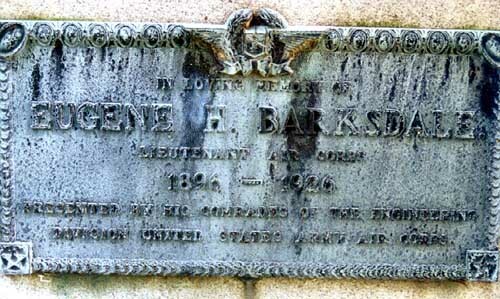 Lieutenant Barksdale was buried in Arlington National Cemetery with full military honors. 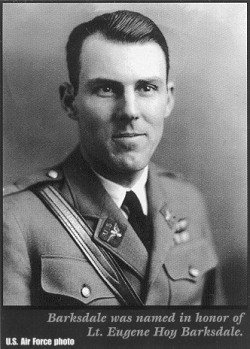 DAYTON, Ohio, August 11, 1926 – The brilliant career of an Army air ace, Lieutenant E. H. Barksdale, who was credited with having bagged half a dozen airplanes during the World War and who many times escaped death by a hair, was ended at McCook here today when he jumped from his plane and his parachute failed to open. Shot down from a high altitude and wounded during the World War, Lieutenant Barksdale merely scoffed when death reached out to him. Time and again he grinned when his motor failed and he was forced to jump. Today necessity again demanded that he jump. While more than 1,000 feet in the air, in full view of F. Trubee Davison, Assistant Secretary of War in charge of Aviation, his plane went into a tail spin. Apparently realizing he would be unable to right the plane, Lieutenant Barksdale jumped. His parachute caught in the fuselage and the plane swung over and the body of the officer was seen to fly through the air. Then, within 100 feet of the ground, his parachute became loosened – the ropes sawed in two – and the Lieutenant was hurled to the ground. He was killed instantly. Barksdale entered the Army Air Service soon after the war was declared and in a short time his ability in the air attracted the attention of his superiors and he was sent to France. During his service with the Expeditionary Force he was officially credited with having bagged four planes, while unofficial records say he brought down seven. Barksdale was only stationed here temporarily. His assignment called for him to test planes and new devices with which the government hoped to make the air safe for its fliers. It was during one of these tests today that he met his death.